ODCA Venezuela: The radicalization of Chavez: a break or break? The radicalization of Chavez: a break or break? It must be difficult to be Chavez today. 11 years of promises, of people buying, of exhausting B.S. and still you do not have the country on your side and your poll numbers are below 50% because some malcontents grumble about the lack of water, lack of light, lack of security, lack of food items at the store, high prices, lack of personal security.... From the comforts of Miraflores Palace where Chavez has grown fat and lazy and egomaniac, it is difficult to understand the growing restlessness, the unwillingness of too many to give him that blank check he so wishes for, to bring us to a Cuba like "mar de la felicidad", sea of happiness. And yet, the dense fog of hubris does not stop reality to seep inside the mind of Chavez, and he sees that he cannot rely on anyone as even some of his alleged close followers are rumored to be reluctant to become mere Cuban colonial employees and prefer to resign. Thus Chavez has launched himself into the only thing he knows how to do: divide the country, scare people, blackmail them, impose his word if not his will. In short he is running again, in the campaign of his life because he knows that his entourage is only able to hire buses to ferry red shirts, if that much. And because if he loses this one he will be out, from the hand of his own people. Two recent events illustrate quite well this anxious Chavez. A Friday before last he convoked a march of students to try to counter the very successful real student protest against his repression and terrible management of the country. I was at my Chiropodist the following Saturday, dealing with an ingrown toe nail and reading Panorama waiting for my turn. The shop owners are clever, they buy Panorama and El Universal for the customers waiting room. Panorama, once the respected newspaper of Maracaibo, one of the only three papers able to give a run for their money to the Caracas ones, has become so pro-Chavez that it is embarrassing. Witness this picture illustrating a quarter of the front page, of a Chavez brandishing with a black glove the Bolivar sword calling "his" students to arms. The caption says it all, only the students attending "bolivarian universities" are the true students. dismissing the "manitas blancas", little white hands, as fascists and what not. Hence the threatening, simplistic black glove? Except that his student rally saw too many buses as usual (opposition student marches never need buses to fill their ranks), and as Globovision lovingly retransmitted, most of these chavista students looked suspiciously like public employees requested to march. But that is really not the offensive part, not even the silly vest calling for the fashion police: the problem here is a clear image of Chavez calling for violence, as if the opposition could overthrown him just as he controls EVERYTHING in the country, including, he never tires of reminding us, the gun power. Is he really trying to let us know that his patience has run out and unless we submit to his will it is going to be "off with their heads!"? Today there was another such sorry spectacle which also combined history rewriting. The old square of El Calvario, built in the XIX century and the first public park built in Venezuela under Guzman Blanco, has been renamed for Zamora, a caudillo of the Federal Civil Wars who did not live long enough to have made himself execrated like most of the other caudillos of that time. Conveniently forgetting that Zamora even had slaves at some point in his life, and that he used populist promises of land redistribution to recruit armies for his own ambitions once Caracas denied them, Chavez paints him as second only to Bolivar. As if Zamora had ever shown any significant intellectual abilities to construct a political inheritance of any type. But history of Venezuela is now what Chavez decides so off went the Columbus statue of the park, and the name and tradition (even though El Calvario has long ceased to be a park where you could hang out, invaded by thugs, junkies and what not). 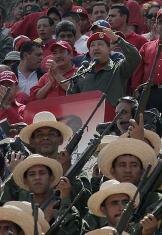 Thus Chavez went today to what is now becoming his weekly mass rally. From El Universal, the picture on the left says it all. The show was set to make Chavez look as the agricultural leader of the masses (the straw hats) while displaying his power with the well armed militia at his feet. Never mind that his agricultural policies in 11 years have transformed Venezuela in a country that needs to import more than 50% of its food, a percentage that keeps increasing. Facts have long ceased to matter in what has become a purely emotional joust. 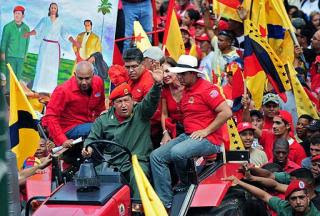 There was yet another telling picture of Chavez arriving at the Zamora square to be. He arrived in a tractor, I suppose honoring the agricultural prowess of Zamora. One is astounded by the levels of sycophancy. First, the painting behind, where Chavez is larger than Bolivar, and as tall as Jesus though a little bit below. And then the security guard holding tight to the truck. Why? To make sure Chavez would not roll on their boots? And look at those clinging dearly for life around Chavez! Eager to be seen in the shot even if they risk their neck! The one behind Chavez with glasses is the new Vice President, a fanatic without charisma or following who badly needs to rub it out from Chavez. Or the Gauleiter of Caracas, the woman appointed by violating the constitution, an individual who has proven her incompetence in the less than one year she has been in charge, who has been publicly scolded by Chavez and who cannot contain her joy at being front line for the tail winds of Chavez. Don't these people have better things to do on a Saturday when there are so many fires to put down everywhere? The radicalization of Chavez this time around is exacerbated because it is becoming clear to most people that he has been a bad manager, that his orders are not followed, that his promises are not materializing and that whatever little bit some thing he has achieved is crumbling down fast, including any pretense of an ideology he tried to build up. So he needs to show authority, to pretend that he is in charge, be it expropriating a supermarket, be it demanding public servants to bow to him, be it insulting people, be it threatening them directly with weaponry. In other words he is resorting to his last resource: be the only bully around. I am not the only one thinking like this. As I was researching for these words I run into an interview of Luis Vicente Leon who in general irks me a lot by his tendency to believe that pollsters should rule the world. but for once I agreed with him. Chavez is indeed in need to show that he is the strongest, if anything by doing the craziest things just because he can get away with it. One of the subliminal messages he sends, I would add, is that "if you cannot beat me, then join me, or shut up!". Luis Vicente for once in a show of modesty says that he cannot tell whether this will succeed because the campaign is not anymore between Chavez and the opposition, but Chavez and the lack of electricity and so on. Whatever it is, it is quite a gamble. If with his amazingly aggressive start of the year Chavez does not manage to raise his numbers he might finally fall into the death spiral of politics, the one from which politicians never recover. But then he might not as the devaluation is going to bring a sensation or prosperity in lower classes as Chavez will simply spread depreciated currency. How long will it take for the people to realize that the cash is worth much less than before? A month? A quarter? by September? Leon seems to be betting that Chavez could have time to buy his way out, but he is not sure, not because Chavez cannot do it but because it might be too late. I personally think it is too early for Chavez to do what he does because there is still 6 months ahead and the more he spends the more he risks to bring the economy down by denying resources where they are really needed right now.